A carabao went on a rampage and gored two butchers before running through the streets of Manila on Saturday. 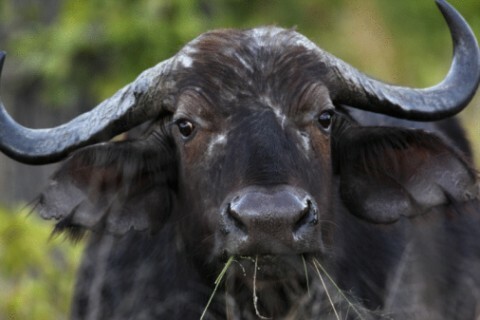 The carabao gored both men and then terrorised hundreds of people, tossing furniture and other items at a small hotel. Three people in all were injured by the crazed animal. “I ran, but it was faster. It tossed me into the air with its horns and when I woke up, I was being stitched up in hospital,” said butcher Jonet Rufino, the first victim. “In my 14 years at work, this is the first time I was attacked by an animal,” said the 35-year-old, who required 14 stitches to a wound on his backside. The animal broke loose from the truck as it arrived in central Manila to be slaughtered. The beast had massive 18″ inch horns. Not only did the animal run through the busy streets of Manila but also created an evacuation of 200 people at a call centre and demolished furniture at a hotel. The third victim to be gored was a female bystander. It then found the lobby of the hotel and proceeded to break down the doors of the call centre. It took two hours to trap the animal. After capture, the animal was taken to the local police station. Police believe the animal was stressed from long overnight travel and once the gate of the truck was open the carabao went ballistic.